Bean salads are a great way to get fiber and protein without any prep work whatsoever. They become your grains and meat in one speedy dish. The extra fast way to prepare lentils (and a personal favorite) is to buy them already cooked. I usually purchase mine at Trader Joe’s, but most grocery stores will have them canned. 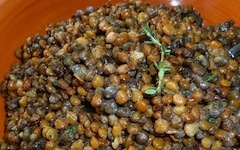 Simply drain and rinse the lentils before adding them to just about anything at your disposal. This “salad” can be served at room temperature, as a warm side dish or cool over leafy greens. 1) Mix all ingredients together and serve.